It may be hard to believe, but I continue to get blown away by this franchise. Mockingjay Part 1 presents us with an increasingly dark storyline that holds our interest and provides us with a scary look at how revolutions play out. 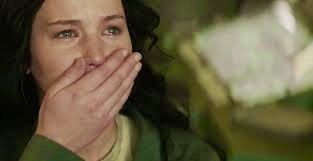 When last we saw our heroine, Katniss Everdeen (Jennifer Lawrence), she had just gotten airlifted out of The Games and was separated from Peeta. Mockingjay Part 1 starts off with Katniss in District 13, a part of Panem that was previously thought destroyed. Untouched by the increasingly violent battles between the various Districts and The Capitol, they hide and build a propaganda campaign. The leader of District 13, and of the revolution itself, President Coin (Julianne Moore), has grand plans for Katniss as The Mockingjay and the head of their efforts towards the revolution. But Katniss is reluctant. Unwilling to see more harmed by The Capitol, she agrees to help the revolution if they rescue Peeta, who has fallen into President Snow's clutches and is spearheading the Capitol campaign for a return to "peace." The rest of the movie follows the results of each side's efforts. This newest installment is much more akin to a political thriller or even a war movie than the previous action-packed movies -- but that doesn't make it any less engrossing. While it clocks in at more than 2 hours long, there wasn't a moment towards the end where I got impatient for the ending. Also they blow up way too many things for you to get bored. Honestly, I think that there are two things working for this franchise that Divergent and others don't have going for them: Jennifer Lawrence as a main character and the fact that she's an actually strong heroine. First of all, whatever your feelings may be on J-Law in real life, you really can't deny that she's a fantastic actress. She plays the character of Katniss in a way that's totally believable. Katniss isn't some damsel in distress waiting to be rescued, nor is she some terrifyingly aggressive character out for revenge. Katniss has a duality that is incredibly believeable. While she doesn't want to be in the spotlight for a revolution that begets death and destruction, she sees the bigger picture of the ends justifying the means. Lawrence plays Katniss with a steely resolve and a hidden vulnerability that makes sense. And while she's awkward at times, it's not the ham-handed nonsense that we get from actresses like Kristen Stewart. Basically, I guess what I'm getting at is that Lawrence plays the character in a way that prevents her from being a caricature of herself. It's very understated and very well done. I don't care who you are, girl's got skillz. 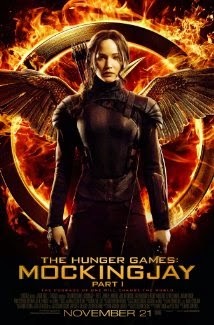 Second of all, what makes this series so cool is the fact that Katniss is a true hero. She doesn't rely on Peeta or Gale to keep her safe (in fact, she keeps herself pretty occupied in the first two films trying to save both their asses), she doesn't shy away from combat or conflict, and she doesn't revel in vanity or appearance. In fact, in this movie we see her basically stripped of all makeup and costume. She's purely consumed with a desire to make life better for the Districts, taking her memories of the Hunger Games and using that horror to power through to a better future. 8.5 outa 10. Really well shot, well acted, and well done. Why is Every Movie a Thousand Hours Long?